To tape or not to tape, that is the question? Interestingly showing the photo's to non caving friends to show off the beauty beneath their feet, one of the first things they commented on was why I would take photographs with litter in the picture. I explained what the taping was for and after explaining the context of what they were looking at they agreed about the need to protect the environment, but still said that the tape looked out of place, odd and preferred photographs without it. It is a reaction I have had a few times in the past, always from non cavers. You get a completely different reaction from most cavers when posing the same question as they already understand the context and are acclimatised to seeing the taping in the photographs. Obviously if photographs are being used as an archive or historic record then the taping should be included. I was recently asked my personal opinion on this about some of my photographs where taped areas have shown no taping because I have digitally removed it for entry in to competitions or publications & so there lies my position on this. It really depends on what the photograph is being used for. I always keep copies of the original photograph showing the taping to 'prove' the area wasn't disturbed to create the photograph and in an ideal world this would be fine for display, but on my first year entering the Hidden Earth photo salon I was given feedback from the judges that the taping in a photograph of Tea Junction which showed the red and white tape was a distraction from the composition and that had it been physically or digitally removed from the shot it would improve the shot. Personally I don't like moving tape and so have learnt how to do this in post process as I do understand that if it is being displayed to an audience who do not understand what they are looking at it can distract from what the picture is trying to portray. Of course sometimes you need the tape to give context to show why a model may be in an 'odd' place within a shot, so it is always a dilemma when trying to display to a wider audience. Debate and over to you!!!! Re: To tape or not to tape, that is the question? Luck of the Draw is a Great trip, like you I have no problem with the taping to protect the formations and easily removed post processing depending up on its use. And it's not so easy for us cave videographers to remove tapes in post production. While I accept that some paths can be useful for protecting floors that are worth it, I have seen zero evidence that tape protects formations. Conscientious cavers don't need tape, unconsciousness cavers ignore tape. So it's trash. 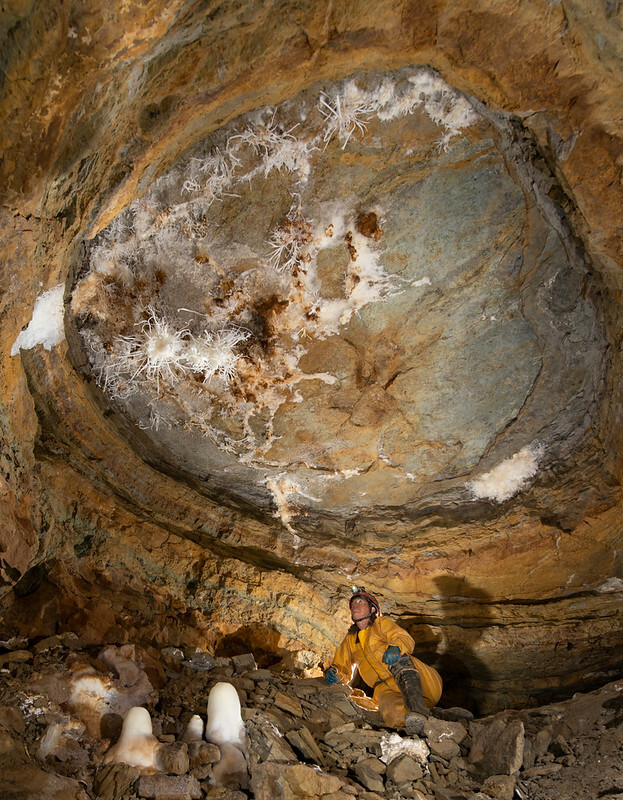 That cavers are accustomed to seeing trash in cave photos doesn't make it any less garish. Some of my most fulfilling projects have involved removing tape from decorated caves. Tape works very well when it's combined with locks and a conservation warden. Otherwise it's questionably useless. Draenan is a special case regarding tape. CADW has actually declared the tape part of a historic monument, and so the tape is going to be taped with "tape tape" to stop the tape being damaged. About 4km of tape tape have already been carried in. Make sure you stay within the tape tape on your next journey in so the tape is preserved. Some say Draenan is a conspiracy to keep the struggling tape industry alive. I believe the OP is referring to whether to show tape or not in the shot, not the merits of cave taping in general. If it's relatively easy to remove the tape by post-processing that sounds like the best of both worlds. The red and white tape is particularly prominent, and even as a caver it's a bit distracting. Glad you don't have to physically move and replace it. I am aware of at least one site that has (relatively) recently been taped using very thin, bright yellow dive line on thin stainless risers that hold it above ground level. It is much less intrusive than plastic tape and I am sure will last much longer before needing to be replaced. It is virtually invisible in photographs, but is perfectly clear when passing by. 3 Likes Gollum, droid and Ian Ball like this. We started taping in Bagshawe Cavern about 15 years ago and used this system (though we used dull orange builders string (the type used for setting out etc) which is barely visible. This conversation has been had many times on theses forums and I'm quite frankly staggered that people are still using that horrible red and white tape. Dont get me wrong, its better than no tape, but in the long run its awful, and lends weight to the argument that "taping looks bloody horrible so lets not bother". Do it right first time!!. I remember going through Drenen, back in the days when it had a padlock with numbers so I could actually get in there. When I was traversing that all I could think of was the road works on the M6 I just drove through, as that was what the cave felt like to me, with red, white and orange. A very unnatural experience, when you are used to Dales caves, where tape is only used when needed. Why is it in Wales you tape everything, making the caves look very artificial, there is a thing as too much of a good thing (or bad) depending on how you look at it. So tape where it is needed but don't tape absolutely everything, an established path through the big passages normally shows where people should walk. I know the mentality is that tape is temporary where damage is perniment but when is tape ever removed, I argue it's also there for ever only to be replaced by new tape, if it gets washed away or trampled through the cave deposited as yet more plastic rubbish in the eco-system, which is my second problem with the stuff! Wales has more tape as there are more mud floors where cavers don't stick to a single route (in Yorkshire people managed to obliterate the painter's palette before it was taped). The tape in the image is awful and rather makes it look like a crime scene or roadworks. I know tapes work ( or rather when they dont ) being a warden at Fairy Cave Quarry for 50 years. Just take The Frozen Deep for instance . The top end would have been ruined by now if it was not taped off. Plus, of course, how would you mark the circular path which preserves %99 of the rest of the chamber floor including the cryogenic stal and untrodden sediments. Its all been argued here before plus the point about editing out the tapes in the published image. Why do some Welsh caves have so much tape? Compare the untaped mud trampled to oblivion in Aggy with the protected mud in Draenen and other more recently discovered caves for your easy answer. Can't say I'm too bothered with tape in photos but edit it out if needs be, why not? I've heard several cavers say they really don't like raised tapes on wires (even heard it again last night). I find it much more artificial than tapes laid on the ground, even the red and white. To me, tape laid on the ground and held in place by rocks seems like it's cavers doing the minimum to look after the cave. The raised tape, with wires drilled into rocks and the attendant rock dust, seems much more developed, show cave like. That's just how it perceive it. I've been involved with installing both types. If you put tape down in most bits of Yorkshire it would get washed away... Active stream passages are generally robust and don't need taping. Yorkshire caves _tend_ to have fewer formations as most are not the ancient dry fossil passages that Welsh caves often contain. Those that do deserve protection, although I think (as with elsewhere in the country) much as already been lost. In places like OFD2 the floor has often been there for tens of thousands of years or more. It's a real shame (with the benefit of hindsight) that places like the main entrance passage and BCNTE weren't tramline taped; same with large parts of Daren etc. The entire floor of these caves has been destroyed, and the delicate mud surfaces and unpolished boulders will never fully recover. That said, some recovery can take place e.g. if you look at the taped off bits right next to the entrance of OFD2 there are signs that the calcite floor drips, for example, are regrowing. Tape is important even for the most conscientious caver - if you have a wide boulder passage, often there is no natural route and realistically people won't take the same route, regardless of wear, unless they are given a route to walk along. Taping can preserve most of the passage width in its natural state without impeding access; I personally believe that this is an entirely reasonable compromise to make. And yes, tape in photos is probably annoying but the alternative might be a) the floor in front of the feature being photograph is muddied, polished and full of footprints and b) careless cavers might have destroyed the thing anyway! I know my opinion is controversial as I am not towing the line (or should that be tape), it's good to back to normal? But, I would rather see polished rocks then loads of red and white tape protecting said rocks. Delicate mud and calcite formations I understand, but rocks, you really tape off rocks? All you do in this situation is increase the wear on one point and make it even more slippery and muddied and horrible on the route that everyone uses, focusing the destruction to one point, where as it would have been if it was spread out a bit and not be any where near as visible as the whole passage look similar. What you do end up with is basically one long show cave when you tape everything and a complete lack of sense of you being in a wild cave (or a building site, which is another image that comes to mind). I am not saying don't tape but, do we really need to tape off rocks and every bit of passage? Again it seems like more restrictions on "go only where we say", which is prevalent down south. Caving for some people like me is avoiding the control that other people try to place on me. I like to explore caves, not just stick to the beaten track otherwise I would just go into show caves. With this much taping there is no sense of trying to find the way on which is part of the fun of caving if you just follow the path so clearly laid out in-front of you. Tape should only be used when there is something to protect, not for cave decoration as it appears to be. Need to get the balance right and I think in Wales it's gone too far, making the caves nothing more than glorified artificial show caves. As for photos, I imagine without expensive software it would be quite difficult to try and remove the tape from the images? How much does Adobe photoshop go for nowerdays? If the original question related to whether tapes should be in photos, then one option is to take photos of what is being protected to record it - and concentrate on close-ups where the tape won't feature anyway. One thing I like about stuff taped off is that it draws attention to something special that I might otherwise not notice. I will often stop to look closely at something that has been protected. It might be some delicate deposit, or small crystals. Photos of this sort of thing are just as interesting as the wider shots. All photographers should ask themselves what is the purpose of the photograph. Am I primarily recording a caver, a passage, or a feature within the cave? Is it purely for artistic reasons? Perhaps it is only in the last instance that the tape is intrusive. And a minority of cave-photographers might be classified crudely as willy-wavers. "Look where I've been. Look what great photos I can take." I wonder whether such self-absorbed individuals really care much about the caves they photograph. I am NOT accusing anybody in this debate of this before the accusations start - it's just something I have observed from time to time. (Again I must stress I am not against using tape, just the need for such quantities of it, which makes me feel like the above when I was down in Wales). I know it's there to protect the cave and it's not there as people get some perverse pleasure from controlling me, it's just how it feels. I feel a review should be made after the initial exploration. Do we really need to tape X or Y or Z?. Does the tape make the cave look worse than if it was not there in the first place? Is not having polished rocks worth it for the cave looking like a building site? If no review is made then the tape itself should be classed as permanment damage and should be considered as such when placed and weighted up accordingly. P.s. it looks like the tape should be there in the photo at the top. What's wrong with removing the tape for the purposes of taking the photograph and then replacing it? I get irritated by the 'it won't work here' brigade regarding anything (they are usually wrong). The system of unobtrusive trail marking using coloured reflectors works well in Australia and the New World and is often combined with use of clear fishing line on risers in certainly positions. I brought home some sample trail markers but can i get anybody to trial it in any cave - no. Trialling systems would give us an idea of which works best and I do find yards of tape (police, warning, orange, white paddock) completely destroys the aesthetic of the cave. Perhaps somebody will be brave enough to eschew tape and go for the continental system - not holding my breath tho'. I agree mrodoc and if I find a cave with big huge passage like that, that is how I will mark it (If only I was so lucky!). I am trying to remember how it worked in the Berger, I certainly don't recall miles and miles of tape. The time machine has reflectors laid through it to guide people. High Time in Charterhouse has reflective markers to guide the route, with a few bits of tape marking specific features. Which is a sensible compromise. We obviously look at the entrance of OFD2 in different ways - to me it's a horrible polished mess that's far less wild than the moor outside :P and it can't possibly get any more polished... I'm sure there are wild parts of OFD but I'm not sure I've travelled in any yet. I've seen them - above me, below me, or through tiny spaces. The reflectors in the Time Machine don't stop you going all over the passage, and Charterhouse is leader led? and Charterhouse is leader led? No they don't, but neither does tape which still relies on the caver acting responsibly and not crossing it. The purpose of marking routes, by whatever means, is to guide cavers through the path of least destruction, rather than to act as a barrier. Some methods are more obvious and may be better suited to easily accessible areas, visited by many inexperienced cavers. Other methods are more sympathetic to the natural environment, but require more care from passing cavers and are perhaps better suited to more remote areas where traffic will be less frequent and more experienced. Yes (as John has confirmed). I guess that as above, you would expect a higher level of awareness and care as a result of the leader, hence a less intrusive marking system is appropriate.